A teenage boy must deal with his mother’s complicated responses after his father temporarily abandons them to take a menial and dangerous job. 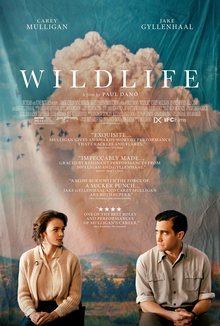 ‘Wildlife’ is an assured directorial debut from Paul Dano about a teenager caught in the middle of his parents disintegrating marriage, set in 1960s Montana. The film centres on the Brinson family, Jeanette (Carey Mulligan) and Jerry (Jake Gyllenhaal), alongside their teenage son Joe (Ed Oxenbould), and we join them shortly after they’ve moved to Great Falls, Montana. Tensions are high within the marriage from the outset and this is exacerbated when Jerry is fired from his job and decides to take a low paying job fighting forest fires, requiring him to move away for a period of time. From this point on it’s essentially a two hander between Mulligan and Oxenbould, as we follow Jeanette’s increasingly irrational behaviour and the impact it has on Joe. This is a quietly absorbing film that paints a picture of a family in crisis with nuance and care, supplemented by a deft filmmaking hand from Dano who shows he has a real talent for directing. The characters are relatable, if not sympathetic, and the role of Jeanette provides Mulligan with a platform to deliver one of the best performances in her career. Ed Oxenbould is also excellent in a role that primarily requires subtle reactions and we really feel for him as he is caught up in the problems brought on by his parent’s actions. The screenplay is based on a 1990 novel by Richard Ford and adapted for the screen by Dano and Zoe Kazan (his wife and fellow actor), and it feels like a relatively old school piece of work, focusing the attention on the characters and the performances. Alongside the terrific performances (Jake Gyllenhaal is also excellent and I’d happily watch Bill Camp in anything), ‘Wildlife’ is also very well shot, bringing out the beauty of remote Montana, and I thought this was a very strong piece of work that packs a hefty emotional punch. I thought this was a really accomplished debut from Paul Dano and the superb final shot is one of the best cappers to any film I’ve seen this year.